Jerusalem (CNN) - Mitt Romney's presidential campaign reversed its decision to bar reporters from an upcoming fund-raiser in Jerusalem, saying on Sunday it will now allow a pool of journalists to cover the presumptive GOP nominee's remarks. 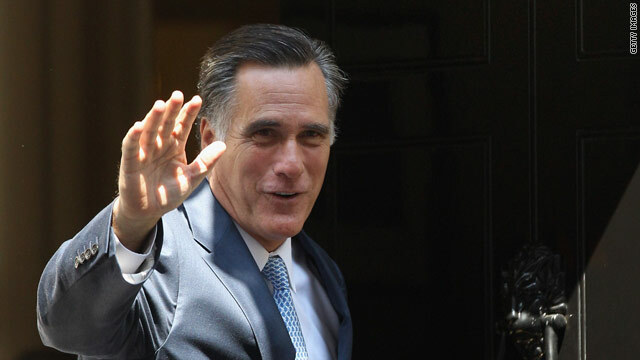 A rotating small number of reporters attend the candidate's fund-raisers held in public places – such as Jerusalem's King David Hotel, the site of Monday's event – and share their reporting with other outlets, but reporters are not allowed into Romney's fund-raisers in private homes. Several reporters attended part of Romney's fundraiser in London on Thursday. Romney's closed-door fund-raisers and his private comments to donors were highlighted when reporters from NBC News and The Wall Street Journal overheard Romney telling donors in a backyard in April that as president he might close the Department of Housing and Urban Development and scale back the Department of Education, items he had not rolled out in public events at the time. In response to the news, Obama campaign senior adviser David Axelrod tweeted, "After London debacle, Romney team re-institutes Mittness Protection Program. Now media will be barred from his Jerusalem fundraiser." In another tweet, he added, "Is it because Sheldon Adelson, the SuperPac King, will be among the guests?" Romney always changes his mind so what's the news here? I don't think Romney knows what he's doing! How do you run for president ot the U.S. and hide at the some time? Run or hide, what's it going to be Mitt? One can only conclude Romney has much to hide. As someone said, :he is a hidden man." Maybe Mitt will run and hide, and let Israel do his fighting for him. One can only conclude Romney has much to hide. As someone said, "he is a hidden man." How you run your campaign is how you'd run your administration. Romney needs to release his tax returns. Letting press into private fundraisers is less important. People know that the rich support Romney, but they don't know how Romney amassed his fortune. If Romney believes in America, as his slogan says, how much of his fortune is stashed away in Swiss and Cayman Islands accounts to avoid paying taxes? What are thery afraid of? The questions from the audience will be geared towards specific tax and regulation policies that will benefit the wealthy donors at the expense of the middle class. In addition, the questions will also be worded in a way for Romney to bash Obama. Ask yourself this, why doe billionaires dump millions and millions of dollars into a campaign? The only answer I can think of, is to have elected officials in office who will push an agenda to make even more money for them? Do the Koch Brothers and Adelson really need more tax cuts? They are not job creators, they are personal wealth creators. This guy is more pathetic everyday. How's Ann romneys horse doing in the Olympics? There goes Mittens... flip flopping again. so what else is new? ►The reporters, however, will be escorted out before Romney takes questions from the audience during the event on Monday.◄ Why? It does not matter, someone will be in there with a cell phone. Once again Romney proves he is a man hiding behind/from who knows what. Whatever it is, it must be bad or he would be more open. I, for one, do not want a president who has to hide from anything. session is insulting to the American voter. Wouldn't want the press to hear his campaign promises to the 1%. He will decimate the department of education so that a super poor class would be ripe for slave labor, than decimate the housing department so only the well educated can afford housing. Kind of like how it is in china where companies house their labor force in a on site dorm, than pay them 50 cents an hour. It's odd there isn't more reporting of the campaign promises he makes to specific groups of people in secret. He is supposed to be there for the people, all the people, not just the rich ones. Just another nail in the theory that Romney is there for the 1% and not for the average guy. Romney is looking to start another war with his buddy Ben. This is your future America if you vote for this guy. Your children will bleed and die for this man's corporatist agenda, while his wife dances on her horse and his kids live in mansions, our kids get blown to pieces. He will be worse than GWB. Obama has been a disappointment, but Romney will be an unmitigated disaster. How anyone besides the very wealthy can support this pathological, flip flopping liar is completely beyond me. SHOW US THOSE TAXES WILLARD YOU RAT! Rommy should think before he speaks. The USA should not get involved here. It all comes down to timing. Nothing is happening right now so why rock the boat? When an appropiate time does come, and yes it will, meaning a escilation of tensions, then the USA should put forth a very clear and consice our RULES for OUR ENGAGEMENT. This means what happens if the USA is threatened or attacked, and what is our response to those we ally with? Do we know? Look this is all like a game of chess, do you unterstand how to play the game Mitt? This mans perchant for secrets scares the living daylights out of me. Why would he not allow reporters to let American voters see what he is saying to other nations? Why are wealthy donors following him like groupies? Is it to make sure he stays with what he promised them? Why won't he show his tax returns? Why were Massacusetts government computers destroyed? Why were Olympic contracts shredded? Mitt could have left without any reporters. Whats the use carrying them along with him and not let them do their job? It is hilarious that CNN and all other Obama/liberal supporting MSM had no problem when Obama blocked reporters from events before/after Obama was elected. Not one word of complaint/criticism was ever spoken/reported by any of them. They had no problem when Obama/liberals used dark, smoke filled back rooms to threaten and bribe to get Obamacare shoved down our throats either. The MSM had no problem when before/after Obama was elected, they were only allowed to be present if it significantly benefited Obama. I say great job Romney--if Obama and the liberals can do it, so can you. The liberals and Obama/liberal supporting MSM hate it when you use the same political games/tactics that they use! !